The Smithsonian Women’s Committee granted the Cooper-Hewitt National Design Library an award in 2012-13 for the preservation and re-housing of two important and rare embroidery and lace manuals dating from the early 17th and late 18th century. Due to their poor and fragile condition, they could not be handled and would have continued to deteriorate if left untreated. The Cooper-Hewitt National Design Library collects “how to” books. Manuals about how to build things, how to mix dyes, how to decorate; instructions and techniques for creating both luxury goods and objects for daily living. Many of these instruction manuals and pattern books are part of our Special Collections. In 2011, the Library conducted a Collections Care Preservation Fund Condition Survey of a select number of our rare and special materials. This formed the basis of our Preservation and Re-Housing strategy, and we are working our way through top priorities’ preservation needs. Book conservator Georgia Southworth was contracted to clean, repair, (in part), encapsulate, refurbish boards and spines, strengthen text blocks, and create custom enclosures for these two manuals so that future deterioration would be abated. They can now be handled without harm, can be displayed and are ultimately suitable candidates for digitization. Ghirlanda di sei vaghi fiori scielti da piu famosi giardini d’Italia. Primo libro. Printed by Pietro Paolo Tozzi in Padua: Libraria de Giesu, 1616. (In Italian) NK3615.T69 1616 CHMRB. 2nd edition of 1604 original. This is a key Italian handwriting sample and lace pattern book published by Pietro Paolo Tozzi consisting of 42 copperplate-engraved featuring writing samples, eighteen within lace pattern borders. It is a rare example of an early 17th century copybook illustrating both penmanship styles and lace patterns of the Baroque period. Left: Ghirlanda before treatment: Earlier large repair fills at upper right corner. Repair papers are badly foxing. Right: Ghirlanda after treatment: Removed damaging and foxed mends at upper right corners with humidity, and replaced mends. Zeichen- Mahler- und Stickerbuch zur Selbstbelehrung für Damen welche sich mit diesen Künsten beschäftigen (In German) f NK9205 .N48 1795 CHMRB, is a very rare and valuable first edition of one of the most extensive embroidery manuals of the 18th century. 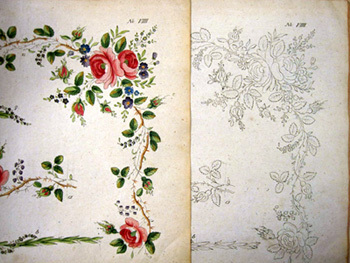 This is a self-study instruction book on drawing, painting, and embroidery for women, created by Johann Friedrich Netto, (active 1795-1809). The folio contains hundreds of designs that can be traced and copied in creating floral embroidery designs. 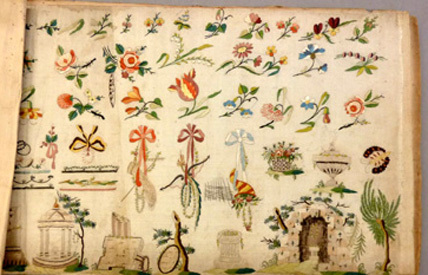 In addition to the design patterns, this volume contains an actual silk cloth sampler embroidered in colored threads, using patterns from a pattern in the book on fabric for embroidery. Georgia created a MylarD® sleeve to protect the silk embroidered sample leaf, which is not adhered to the volume, but protects both sides of the leaf and the support leaf from handling damage. It can be carefully removed and replaced as desired. Each design appears twice: one page in color, one in black and white. The hand colored pages provided suggestions to the embroiderer, and the black and white pages were to be used to transfer the design. Left: Zeichen-Mahler before treatment Caps are missing, endbands are missing, corners are bumped and delaminating. Spine covering leather is very damaged, with heavy losses of surface grain and tooling. Right: Zeichen-Mahler after treatment: Removed remaining damaged spine leather, cleaned off deteriorating spine liners, relined spine with 2 layers of kozo-fibered Japanese paper, and single layer of aero-linen, with flanges for reattaching the boards. These two books were very important and popular publications in their time, as tools for teaching the art of handwriting, lace making, and embroidery. They, in their original and later editions, established technical standards for these crafts, and the same time, promoted styles that were copied and adapted worldwide. They document the processes used to create objects that are studied in textiles collections today. The Cooper-Hewitt National Design Library is grateful for the generous support of the Smithsonian Women’s Committee!